CertifyMe.net offers comprehensive, on-site forklift training for a variety of industrial workplaces. This essential instruction reduces injuries, material damage, and other accidents. While proper training is important for fostering a safe place to work in, it’s also crucial to adhere to common-sense warehouse safety tips. When used together, forklift training and a comprehensive safety plan is your best bet against preventing workplace calamities. Learn what the most common forklift accidents are, and what the most important warehouse safety tips are to prevent injuries and fatalities below. When proper warehouse safety practices are ignored, accidents involving forklifts are all too common and can cause serious injuries and deaths. The best way to avoid forklifts coming into contact with pedestrians is to arrange the work area in such a way that the two populations are isolated from each other. A further protective measure is to insist that all pedestrians, employees, visitors, vendors, contractors, etc., wear a reflective high-visibility vest while on the floor where forklifts are operating. Crush forklift injuries often happen when a forklift tips over and the driver tries to leap free of the vehicle. The Number One rule for reacting to an overturning forklift is to remain inside and keep all parts of the body under the protective canopy. This is against human nature and needs to be reinforced by keeping seat belts fastened, training and constant reinforcement in the form of signs in the workplace. Here are some warehouse safety tips to keep in mind. These are great for year-round safety, and especially during those times when your company is under-staffed, working overtime, or operating during the holiday season. 1) Don’t forget to gear up. Safety gloves, hard hats, reflective tape and other attire should be worn at all times. If you’re unsure what equipment should be worn, check with your supervisor or company safety guide. 2) Define those hazard zones. For certain areas in your warehouse, it’s a good idea to keep non-essential employees from entering. Deploy yellow caution tape, orange cones or even extra personnel to ensure special procedures, heavy loads and other uncommon tasks can be performed without distraction. 3) Keep it clean. A clean workplace is a safer workplace, and that certainly applies to warehouses. If you notice a spill in the aisle, clean it up immediately. For larger spills, notify your supervisor. For those areas near truck loading docks, weather can pose unique safety challenges. A slick or wet loading surface is the cause of many warehouse accidents. Ensure salt and snow removal equipment (blowers, shovels, etc.) are on hand to keep the ground free of moisture. 4) Have an exit plan. Does your warehouse have easy-to-read exit signs? This is a frequently overlooked factor, but simply knowing where to exit the warehouse is a matter of life or death during a fire. 6) Maintain your maintenance schedule. Keep a rigorous maintenance program for all of your equipment – forklifts, pallet jacks and more. Many workplace accidents are caused by faulty, defective forklifts. With regular maintenance a part of your daily plan, safety will naturally take care of itself. 7) Check your racks & shelves. Remember, safety isn’t all about forklifts all the time. Your cargo and goods need a stable, safe place for storage. This means that your racks and shelves should meet & exceed load standards. Ensure your forklift operators aren’t overloading the maximum capacity requirements – if they are, big problems could be headed your way. 8) All clean hands on deck. After the daily grind, make sure your floors are clean for the next shift. Fork-mounted brooms are a great idea in this regard. A clean sweep will help the next group of workers enjoy a clean, safer workspace. Of course, all spills and hazardous obstacles should be cleared immediately – this goes without saying! This is a good idea for warehouses, dock areas, shipyards and other areas where forklifts and industrial equipment are active. 9) Limit forklift operation to only fully trained personnel. You have to be firm with this one; just one slip and you could be looking at big fines from OSHA. Even if it’s “just a little job,” no forklift action should be undertaken by someone who isn’t properly instructed and trained. 10) Remember to break. Long shifts, overtime, covering for someone who called off – there are many times when an extra 15 minutes turns into 2 hours out in the warehouse. Federal regulations don’t require a certain amount of break time during a shift, but local and state OSHA chapters can dictate minimum break requirements. Check with your jurisdiction to make sure you and your employees are given a fair amount of time off during a shift, even it’s “only” 8 hours. And most importantly, invest in education for your workplace. While there is no foolproof way on how to keep your warehouse safe, all of the common causes of forklift fatalities can be remedied by modifying the conduct of everyone on the shop floor. Even the most carefully laid-out warehouse is no match for the fallibility of the human. CertifyMe.net can help your firm by providing extensive training efficiently and inexpensively. What Does OSHA Have to Say About Warehouse Safety and Forklifts? OSHA agrees with us that one of the most important aspects of warehouse safety is ensuring all forklift operators have received their training and certification. As the most effective way of preventing accidents, forklift training is the best thing employers can do to keep their workplace safe, and avoid costly fines and legalities. According to OSHA, forklift training must include formal written instruction, practical training, and a skills evaluation to make sure workers are prepared to operate forklifts safely. 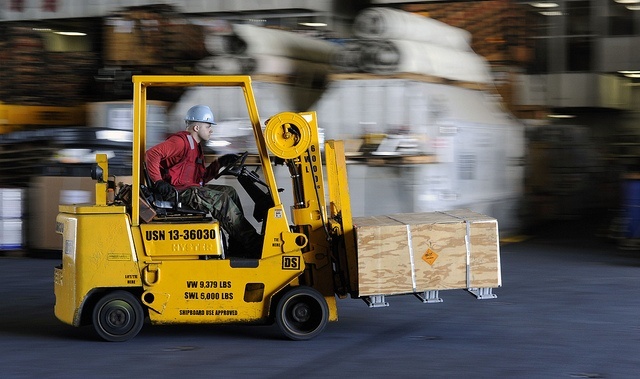 Forklift accidents are preventable, with the right training in place. If you’re looking for the biggest bang for your buck with the most cost-effective training course, then look no further than the forklift training program from CertifyMe.net. We’ve made our program as easy, quick, and affordable as possible, while delivering all the information your workers need to prevent accidents in the workplace. 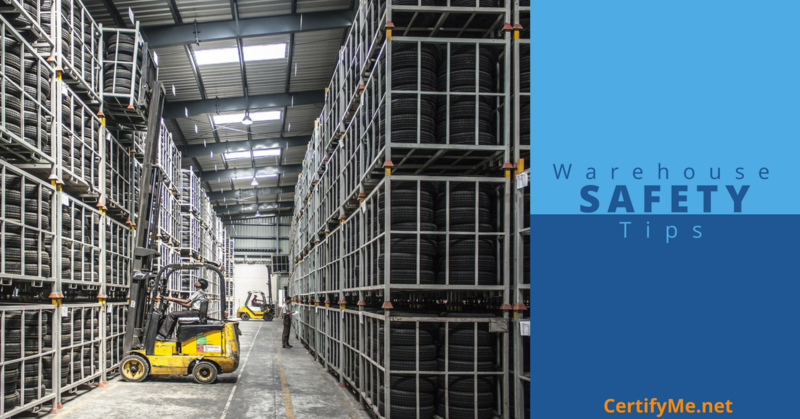 Our courses are completely OSHA-compliant and will improve your warehouse safety practices. In only about from hour from any device with an internet connection, workers can complete their forklift training and receive their certification. All you need to do, as the employer, is provide the qualified Trainer to lead the in-person skill evaluations. You won’t need to block out time in your busy schedule for workers to travel to an offsite facility for training. And you won’t need to cover time-off or travel costs. All you need to do is register your company and have workers create their own log in account to access the modules. For only $59.95 a course, your workers can be trained and certified to not only prevent accidents but keep productivity high. Take advantage of the best warehouse safety tips with the courses from CertifyMe.net. We’ve got all the information and tools you need to prevent accidents and boost your warehouse safety. For more information on forklift training, please call 1-888-699-4800 or visit our contact page. Everyone is interested in getting the most miles out of their cars. CertifyMe.net takes this principle and applies it to the warehouse, dockyard, and distribution center – wherever you move, manage, and store cargo. What’s the secret to getting the most out of your forklifts and other equipment? How can you ensure a long lifespan for your entire forklift fleet? We’ll show you how proper training, setting sensible maintenance schedules, and paying attention to the details can optimize your equipment usage. Want to save money, enjoy a safer workplace, and get the most out of your equipment? Check out this post! Big changes in your warehouse safety program sometimes start with small – yet important – changes. Precautions, warning signs, and other measures can improve warehouse safety…but you have to know where to start. In this post, CertifyMe.net OSHA safety experts illustrate a handful of aspects of your warehouse layout that are sometimes overlooked. How can you designate potentially dangerous columns as safety hazards? What’s a cheap yet totally effective way to eliminate blind spots? Our 5 warehouse precautions will explain these safety tactics and much more, including how you can accessorize your forklift fleet to create a safer, more efficient warehouse – and it’s much easier than you think!